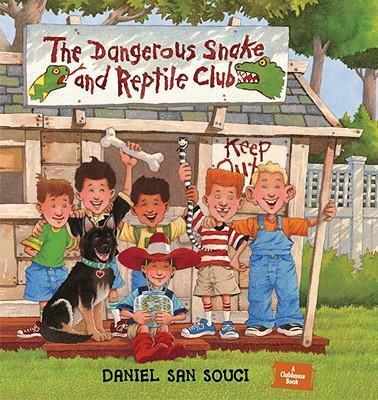 A real-life tale from a treasured children's authorWhen Danny and his brothers Bobby (yes, that's Robert San Souci) and Mike return from summer vacation with a king snake and what must be a dinosaur bone, they can't wait to share their treasures with the rest of the neighborhood. Thus THE DANGEROUS SNAKE AND REPTILE CLUB is born. Now, if they can only keep the star attraction from slithering away!In school assemblies across the country, kids have long loved listening to the San Souci brothers' tales of their action-packed, imaginative childhood--a childhood that has provided inspiration for nearly 150 published books. Now kids everywhere can laugh along as they read about these real exploits in this first Clubhouse Book--an uproarious tale of brothers, best friends, and the adventures only they can find. Author available for bookstore and school events. SPACE STATION MARS coming Fall 2005. For years DANIEL SAN SOUCI has written and illustrated other people's stories. Now, with the Clubhouse series, he tells stories from his own youth. Daniel lives in the San Francisco Bay Area.